The two victims are Quan Un-son and Pak Hui-te. According to the enlistment record stored by the Ministry of Health, Labour and Welfare, both were assigned to the Special Surface Force 104 Squadron under the direct control of the 32nd Army. 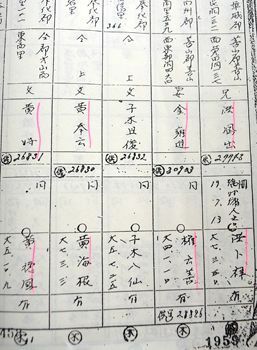 The squadron formation chart also shows that Quan was assigned to the 3rd Platoon on Okinawa Island, and Pak belonged to the 1st Platoon on Tokashiki Island. However, the official record in the Korean family registry only says “missing” and “death” on the Korean family registry. As for Korean victims, more than 10,000 victims are enshrined at the Korean War Memorial in Peace Memorial Park. Meanwhile, the number of inscribed names on the Cornerstone of Peace is 447, which includes North and South Koreans. Inscription of Korean war victims is an ongoing issue for the Cornerstone of Peace.